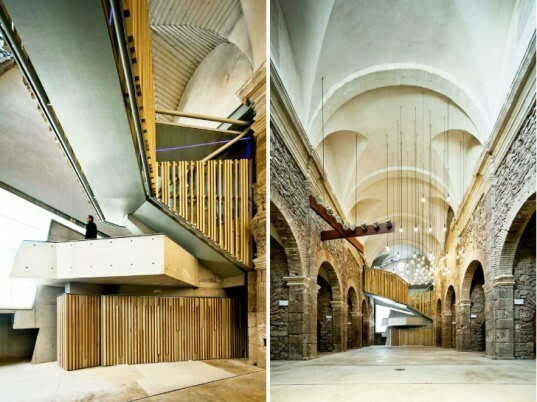 The Catalan town of Santpedor could have demolished its crumbling convent and church to make way for a new and improved cultural center, but instead they chose to preserve and upgrade the space. Catalan architect David Closes was hired to lead the renovation of the Sant Francesc Convent and preserve this historic legacy of the space. Using modern interventions and materials, Closes shores up the ruin with glass, concrete and steel walls, staircases, and ramps. Walking through the bright and airy renovated space is a bit like exploring an archeological dig - read on for a look inside! Sant Francesc Church was originally built between 1721 and 1729 by Franciscan priests, but after centuries of use the space had fallen into neglect and was verging on becoming a junk yard. It had holes in the walls, grime on the plaster, rusty old cars on the altar, and a severely damaged facade - some people wanted to demolish it altogether. 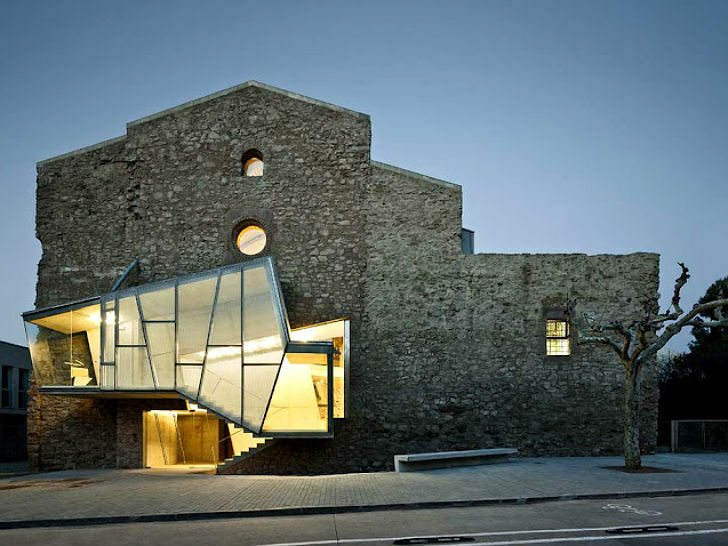 Instead of tearing down this historically important building, the town of Santpedor chose to renovate it into a cultural space and auditorium. David Closes was tasked with preserving the legacy of the building while adding the modern amenities necessary to make the building useful. Completed recently, the church took seven years to renovate and the result is a beautiful mashup of the historic and the modern. Closes retained the rough and damaged facade along with the liturgical spaces, the structurally sound arches, and anything else that could be saved. Where the building was too damaged to restore, Closes designed modern volumes to take their place including a glass and steel staircase on the exterior, a new ramp above the nave, a new deck, reading cloisters and bathrooms. New lighting was also installed in order to illuminate the space and reveal the beauty of both the old and the new construction.